It was quite cold that night in late March. I was hoping for some good weather for this trip as I did not have the opportunity to change it; neither the date of our trip nor the increasing chance of a late winter storm. On this occasion I did not consider a few inches of new snow to be good weather. It was just me and my son giving the Base Camp trailer an opportunity to prove its merits to us. Our drive was to take us West. After making our turn off of the main road and leaving the pavement we drove for several miles far past where all of the trailer camps. that is to say, small cities of trailers had congregated for the weekend, into what I had always referred to as the "West Desert". Literally hundreds of traditional camping trailers from simple bumper pulls to high end triple axle toy haulers had assembled themselves into small cities along our route. We continued along until we were far away from the last one of these groups and found a place just off the road where we could park the Base Camp trailer for a quick and easy setup as sunset was fast approaching. Maybe we went a little too far. My young son seemed to think so once the sun set and the clouds covered up the stars. The only light to be seen was from our tiny campfire and our small flashlights. Every sound seemed to him to be threatening. I raised the two sets of LED lights on the front two corners of the Base Camp trailer and turned them on. Wow! I don't know what the output rating of these lights are but my best guess would be a few thousand lumens each. They lit up our camp site and caused my sons fears of coyotes and other potentially dangerous animals to subside. 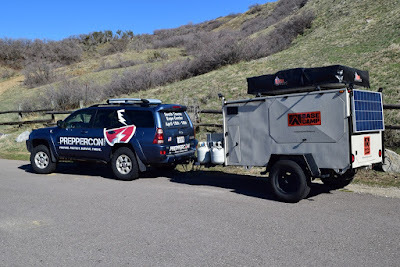 Although this was my first time setting up the Tepui RTT (roof top tent) it was quite easy for me to figure out and it was ready to load up with sleeping bags in just a few minutes. I guarantee that the next time I get a chance to take the Base Camp trailer for a trip I'll have that tent up in no time flat. The slide out kitchen made cooking dinner about at simple and convenient at it could get. Gaining access to our gear through the three large doors was easy yet I was always confident that our valuable items were secure. After about an hour of playing around with our fire the winds decided to pick up, which caused my son to urge us to climb up into the tent. I have to admit that I was looking forward to sleeping up off of the ground for once. We were adjacent to a large ranch where cattle roamed free. It has been my experience that cattle don't always stay inside of their fenced acreage. If we were not up off of the ground in the RTT I would have been concerned about a beef or two stumbling over our us in the darkness. The sturdiness of the Tepui tent was both impressive and confidence inspiring. Being up off the ground away from critters and other dangers put my mind at ease for the both of us. When we woke up I didn't realize that it had snowed so heavily as the tent didn't seem to give an inch from the weight of the snow. 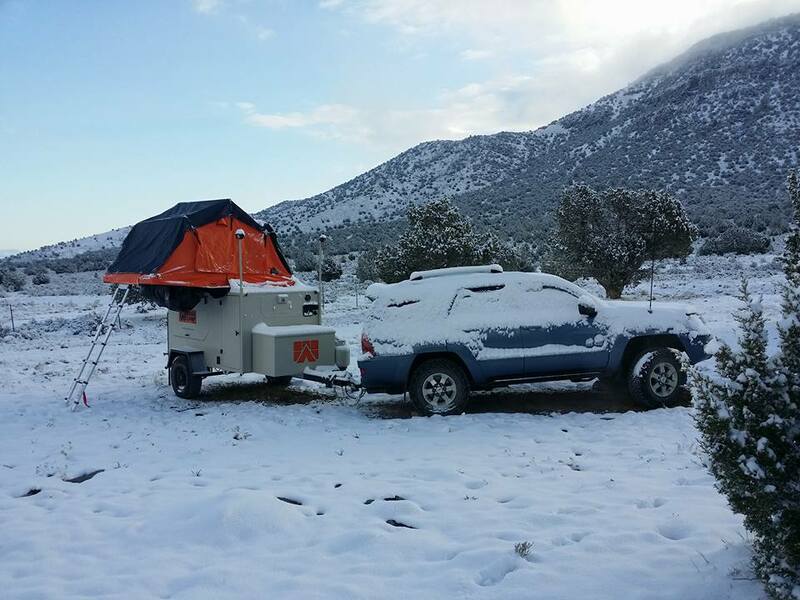 Even with all of the snow, breaking down our camp and putting away the RTT was relatively easy. I put away the tent, slid the kitchen into it's home, lifted the stabilizers up and we were off. Since I was familiar with the area I knew that the roads out where we were get pretty bad when they are muddy so I wanted to get out while the ground was still frozen especially since I was unfamiliar with the towing characteristics of the Base Camp trailer. By the time we headed out the road was beginning to thaw and was already getting muddy, yet the trailer tracked nicely behind us without any concerns. The Base Camp trailer fully loaded costs about the same as where some of the other similar trailers start in price. That said, this base camp trailer model is not built for rock crawling or serious off-road use. Base Camp has assured me that they are working on making additional options available to make this trailer a more serious off-roader. Even without more serious performance upgrades the Base Camp trailer will allow more people to get to more places with more of the conveniences of home than with most other traditional camping trailers. The ground clearance is great and the tire size is just right to allow you to go lots and lots of places. Now, the primary questions is: does The Prepared Guy want one? My answer is definitively, YES! The built in solar, batteries, inverter, lighting, gun storage boxes, EMP box, water heater, water tank, water filtration system, kitchen, firewood box and shower, make this trailer virtually self-sufficient on long remote trips with plenty of room and capability to carry lots and lots of stuff. 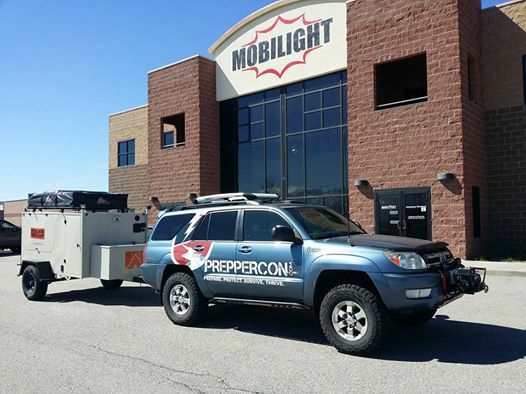 We preppers have lots of stuff. 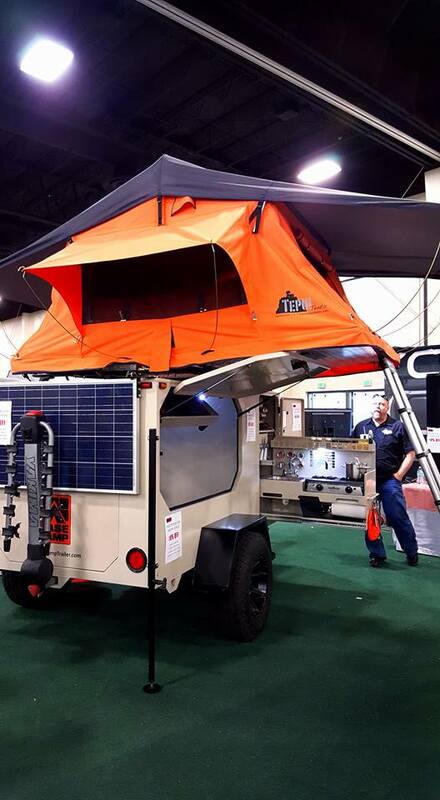 This setup is an excellent option for anyone that is planning on buggin' out who also loves weekend trips out West. Like me. Oh, come on man, man up and admit you were afraid of the dark ;) Hey, I didn't get to see the EMP Box when I checked them out at PrepperCon and I didn't see it on their site, but I would like to. If they are interested, I would be happy to make sure it's up to snuff and help them offer an EM shielding packages for the solar power system that will protect it stowed or even while in use. I'll be sure to mention it to them. Thanks Cache.